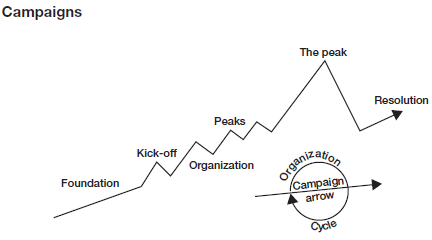 “Leading Change: Leadership, Organization, and Social Movements.” Handbook of Leadership Theory and Practice. Ed. Nitin Nohria and Rakesh Khurana. Harvard Business School Press, 2010, 527-568. 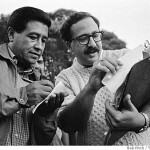 Ganz begins by noting that “Social movements emerge as a result of the efforts of purposeful actors (individuals, organizations) to assert new public values, form new relationships in those values, and mobilize the political, economic, and cultural power to translate those values into action” (509). Ganz defines leadership as the act of “accepting responsibility to create conditions that enable others to achieve shared purpose in the face of uncertainty. Leaders accept responsibility not only for their ‘part’ of the work, but also for the collective “whole.” They create conditions interpersonally, structurally, and/or procedurally. Leadership happens at all levels of a social movement. Because social movements tend to celebrate a collective identity and assert a public voice it is far more common for them to operate on a level of “constituents” and moral suasion than on economic or political coercion. The morals of the individual tend to make them commit – not an economic or political imperative (though surely those are attended to in the hoped for results). Ganz provides a really great definition of agency: “Agency, however, is more about grapsing at possibility than conforming to probability” (511). G. notes that leaders must be recruited, trained, and developed on a scale required to build the relationships, sustain the motivation, do the strategizing, and carry out the action required to achieve success” (512). This highlights the desire of Ganz to get away from particular platforms or ideological pressures and to instead meet people where they are, establishing a rapport based on consubstantiality of narrative. G. goes on to note that exchanges become relationships when a commitment to a shared future and the consequences of a shared past are present. 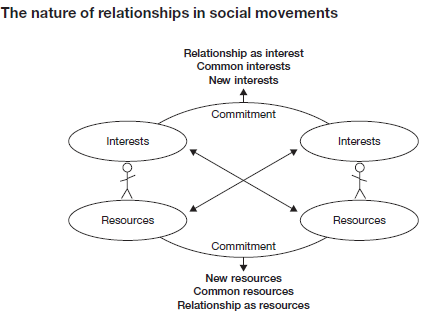 G. notes that strong ties and weak ties are instrumental in any social movement. Strong ties are crucial for facilitating trust, motivation, and commitment while weaker ties are important to provide access to important information, skills, and education. One of the core principles of this movement is the use of “relational” meetings, house meetings, or one-on-one meetings. This means inviting someone to be a host and throwing a get together for attendees to meet, discuss, and go forward to establish their own meetings. The spinning out of a “public narrative” or story that resonates with movement participants (and possible participants) is instrumental in the development of the movement. Via Bruner we get the idea that this narrative is how we exercise agency (defined as “choice in the face of uncertainty”). While the “how” question of social movements can be worked through analytically, the “why?” question tends to operate through narrative. 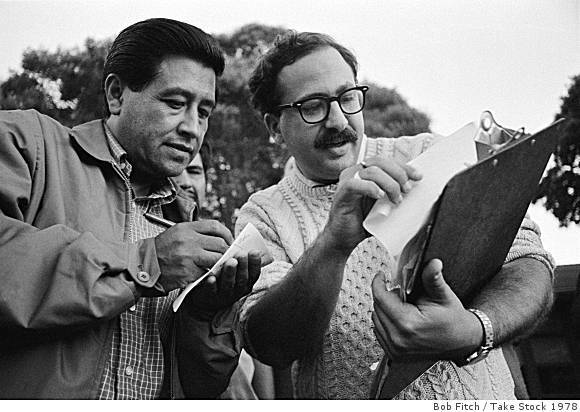 How does action occur in a social movement? Through agitation : “When we experience the world “as it is” in deep dissonance with values that define the world “as it should be,” we experience emotional dissonance, a tension only resolvable through action” (517). What do you do with apathy? You confront it with ‘constructive anger’ or the anger that exists when we feel that our moral order has been violated. Where does hope come from? It comes from the experience of ‘credible solutions’ or the experience of small successes and small victories. Faith also inspires hope as do relationships. Plot: composed of challenge (problem), choice (solutions? ), and outcome (the results of the choice). Are there any analogs here between what Ganz is saying and other theories in the rhetorical cannon? Aren’t these concerns fundamentally rhetorical? Ganz notes that despite the fact that arguments persuade with evidence, logic, and data, stories persuade through empathetic identification (but so do arguments). 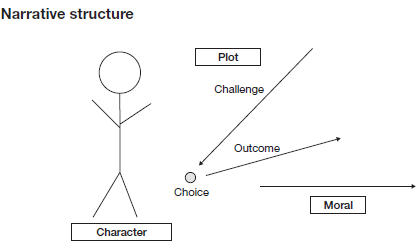 Ganz claims that the “moral of a successful story is emotionally experienced understanding, not only conceptual understanding – a lesson of the heart, not the head (521). Ganz claims that the public narrative that social movement leader tell is one of “self,” (what values call you to action?) “us,” (the values shared in the action) and “now” (the urgent challenge to those values that demand action now: What choice must we make? What is at risk? Where is the hope?). On strategy: If storytelling is the way to motivate, then strategizing is the key to dealing with resource challenges (the fact that challenges to the status quo rarely have the resources of the status quo). The question of “collaboration” or “claims making” in the context of collective action is important. The collaborative makes the most out of participant resources while the “claims making” challenges seeks to change something in the power structure operating in place – to change from outside the organizing community. One of the fundamental problems of social movement action is gaining commitments: the specific pledge of time, money, or action (536). The second problem of effective action is the ability to turn strategy into “specific measurable outcomes with real deadlines” (536). Also, the use of volunteer work must ensure that that work is rewarded and motivational – it sustains the folks doing it by creating a variety of tasks and providing a direct view to how important that particular task is for the folks undertaking it. Action defined: the work of mobilizing and deploying resources to achieve outcomes (535). Ganz identifies the dearth of civic leadership as the result of the decline in civic and religious institutions since the 1960s. The 3 structural challenges of social movements today are 1) the organization of leadership; 2) processes for effective deliberation; and 3) processes for effective deliberation and decision making (542). To address these challenges Ganz and Wageman recommend 1) team design (away from individuals toward teams of collaborative action ); 2) deliberative practive (engage conflict without suppressing it – and to differ without personalizing difference! ); and 3) mechanisms of accountability (name the problem, identify norms that could solve the problem, institutionalize those norms ) (542). 1. The relational model makes perfect sense. . . but what about if the movement begins to transform into something it didn’t start as? Is that a problem? Does it just mean that the movement is meeting it’s constituents in more meaningful ways? How can you use this model to organize large amounts of folks toward one cause? (pg. 515). This is somewhat addressed in the strategy section (530-33); however, I don’t think it is discussed in the detail that I would hope for. 2. How do we ensure that ‘constructive anger’ and ‘moral order’ are in the interest of the ethical? I would imagine that these terms are invoked by hate movements just as often as by progressives. 3. The agency that Ganz sees in human action goes against a lot of theories of causality – especially those from network theory, distributed cognition, etc. The question becomes: can we generate affects in the network or are we only effected? 4. I’m digging Ganz’s work in this piece – especially the sections on the composition of the narrative. That being said, he plays it pretty fast and loose with rhetorical concepts in this section. Does that matter, or is the goal of the work so desirable that it can be ignored?